This blog article refers to my YouTube Video you find here. It shows how an ESP8266 module (like this one) can be used as a (rather unreliable) WiFi range extender. connect another device to the "intarwebs" SSID. If you want to really use that, you should encrypt that side as well. Here is how. The disconnects from the Wifi Router appear to be related to big packets and/or heavy traffic. It has been suggested that it might be a power issue, but neither with the scope, nor with the Fluke 87V's min/max function I was able to detected a significant voltage drop. I have captured the traffic with wireshark, but could not make sense of it yet. My best guess at the moment is that with a big TCP windows size, the module runs into a buffer size problem or that it is busy for too long on the "left" side. 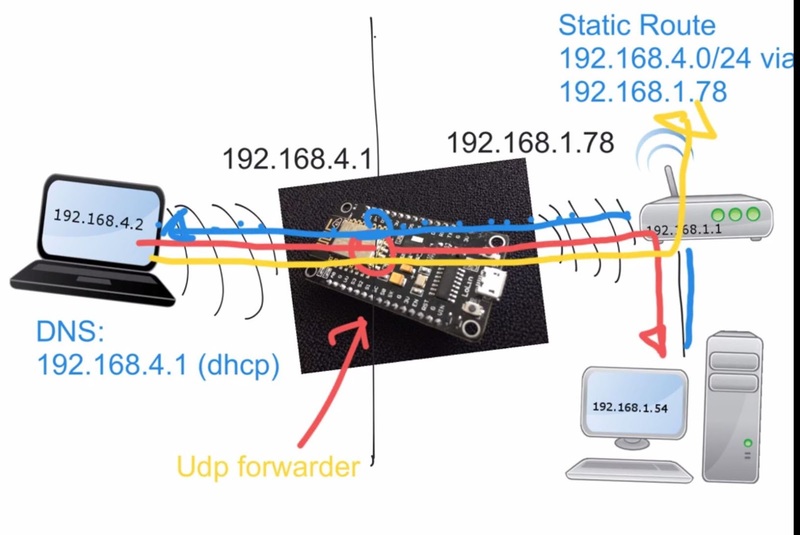 The module only has one radio to serve both connections, so unlike your typical router, it can't forward a continuous stream of packets. Great work! But what is "modified firmware" actually? Yeah, we can just install it to the nodemcu but I want to know more. Can you share changes or source code? These two should be sufficient to make it work. Could you the content of this post without modifying the firmware? Michael, I've thought about that for a while: If we need to stick to the original firmware, we'd need a http-proxy implementation on the ESP8266. While this is certainly possible, I haven't seen an implementation yet. We can only run one TCP server on the module, so support for automatic proxy detection is an additional (if optional) challenge. So at the moment the firmware approach seems like the easiest solution. Post a source code here. Pls. To use it with ArduinoIDE. Or just u grab&post here ? Please, fix URL for "DNS forwarder script"
Thanks for this post. One question have you tried to implement this with the Arduino IDE for the ESP8266? No, only with NodeMCU. If you try it with the Arduino IDE, I'd be most interested in the results. There have been hints in the NodeMCU issues that the disconnect-problem might be fixed in the lastest -dev version. I'll try that some time. Hi, can you share compiled liblwip.a with IP_FORWARD enabled? Hi ! I dont know what you wanted to achieve, but i did a similar repeater focused on one task : when the repeater (running your classic dns-liar dns server, using my speed improvements) is asked for a specific kind of urls (starting with folderxyy/ ) then it tries to hit the same url on the AP he is connected to. A first ESP (located too far from my wifi AP to connect directly with it) can signal that the mailman opened my mailbox by hitting a link on the repeater, which hits the same link on the hotspot. The repeater ESP is put into a recycled phone charger and permanently powered. The ESP in my mailbox is only powered when the mailbox is opened. Good job! I've also thought about a similar solution, but could not get it done because of the "only one TCP server" limitation of the firmware. I'll see if I can work my way around that somehow to make a proper HTTP-proxy chain. Thank you so much for the "IP_FORWARD = 1" idea! (or instead of 8.8.8.8 put IP address of your fritzbox). Yes, you're quite right. That makes things even simpler. - Thanks! Suppose I setup a wifi hotspot on my windows pc and I provide the hotspot credentials to the ESP. How do I add the routing step? "add a route to the 192.168.4.0 subnet to your default gateway (i.e. usually your WiFi dsl/cable router)"
"route add 192.168.4.0 mask 255.255.255.0 w.x.y.z"
you should then be able to send pings between the device connected to the ESP and the stationary PC. The more universal option is to set the route on the router. But that depends on the make/model of your particular router. how do you add a route to the 192.168.4.0 subnet to your default gateway (i.e. usually your WiFi dsl/cable router)? Which esp8266 module u have used? Is it ESP8266 esp-1?? It has an ESP-12e on it. But that is pretty much irrelevant. An ESP-01 will work ok, too. Flash RAM size is not really an issue here. is it possible to use more than one wired channel connect to match WiFi bandwidth? this is the exact idea I have while reading the 8266 specs - putting 2 devices back to back each on their own wifi channel. Did you managed to do some real testing yet? Martin has greatly improved the code and added some great features, including a capture function. I recommend his solution over my approach. Thanks for another nice project link. This one does not work with 2 devices too. It's just using the same wifi channel for both network, literally disabling the network usage for stations located between the base access point and this range "extender". Wie im Text beschrieben, kam das bei mit auch immer wieder vor. Andererseits schaffen es andere Leute ganze Videos darüber abzuspielen. Über die Ursachen kann ich nur spekulieren. Es ist aber einen Versuch wert, die Firmware mit einen neueren NodeMCU Version nochmals zu bauen. Die hier verwendete Version hat ja schon bald ein Jahr auf dem Buckel. thanks for the post. I've just tried it on a Wemos D1 mini with the latest NodeMCU firmware (modified according to your blog and Aex Aey's comment - thanks). And it just works without noticable drops. Great to hear it works for you. People will probably be interested in your firmware, as I haven't updated my build environment for quite a while. Im new to this area, and im studying lua and dont have great knowledge on lua. when i run code gives the error: "ap.lua:11: wrong arg type"
it seems like firmware 0.9 doesn't support set mac function. I think you're quite right: My firmware version is too old and some commends have changed or have been added since 0.95. Have a look at the comment above from "klaca", he has made a new firmware build. Perhaps he is willing to share it. could you reupload the firmware again and maybe the source code. do you have some new stable version? Try [klaca]'s firmware build. He posted a link here in the comments back in September. Hello again, thanks for your reply Andreas Reischle, routing in my router all work good, but now i have other problem. Esp8266 only can connect in AP 4 stations, but i need about 10 stations per AP, i will need to build custom firmware but i dont know if it will work this modify. And only see https://nodemcu-build.com/ and i cant modify any lines, it is automatic, thanks. can you explain how you made setup at router means connection. I am a university student and live in hostel, having wifi but its range is not reach in my room. I figured out that the wifi had 192.168.16.1 and 192.168.12.1 as default gateways. I am unable to access the router page, so can I still have this repeater working. How can I change the 192.168.4.0 thing? and to what ip? User Martin-ger on Gitgub ( https://github.com/martin-ger/esp_wifi_repeater ) has done a much better job than me. His solution includes NAT which should make things easy for you. His binary doesn't work for me either. In which way does it fail? Andreas: Is there any forums for the "https://github.com/martin-ger/esp_wifi_repeater" method of making a repeater. I have two esp 12's which are virtually identical yet one has slightly different logo on the esp chip. both flashed with martins firmware. One of the esp's simply doesn't work. specifically - the Ap doesn't show in a wifi scan. I am ready to hit it with a hammer. I have done a lot of work on the ESP8266, but I never broke one. Still it might simply be broken. If you think it is a software problem, you can open an issue on GitHub. turns out it may have been software issues. flashed using other program + had to power cycle the mcu.